This is where our products take shape. The essential pieces of equipment we use are our hands. In this building we continue all the experience gained from our centuries-old traditions. Our small shops were once located on the ground floor of houses in the historic town centre, such as on Via Solferino, where we were also born and raised. When you enter our workshop for the first time, you may notice the overbearing old scent of the horn, the olive wood and the tools. You can touch the raw materials, such as the cow horn, or watch the entire crafting process, from the rough materials right up to the finishing touches. Like a childhood memory, we bring a tangible human aspect back to work, rediscovering our ability to create and invent new objects, maybe this is why our ancient trade is so fascinating. Here at Coltelleria Saladini, we still produce forged blades. You can always recognise our products by our logo engraved onto the blade (a stamped hallmark), which will stand the test of time. We only make this mark during the crafting process, when the blade has not yet hardened from the tempering. Many other blades that you find on the market have already been tempered and, as such, they can only be marked using surface techniques, such as laser engraving. Consequently, our stamped hallmark is a sign of authenticity which sets our products apart from the others that you may find on the market. It is another guarantee for our customers. We are very selective in our choice of steel since we mainly just use high-quality tempered stainless steel with a high or 100% carbon content. We work the steel blades using two main processes: blanking and forging. 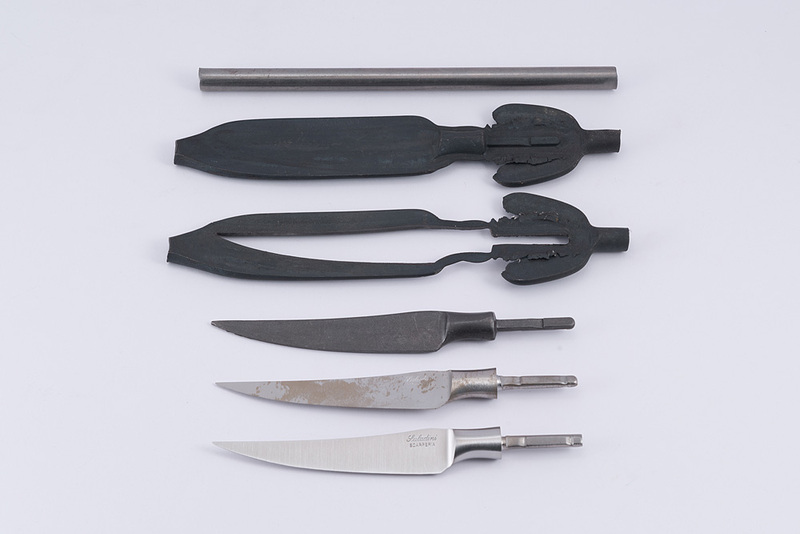 Blanking is used for the blades of clasp knives, cigar cutters and for a certain line of our table knives. 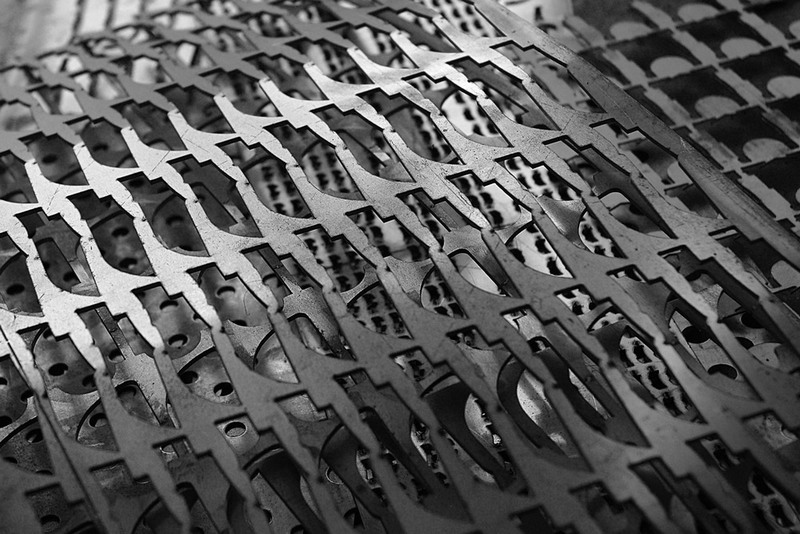 These blades are cut from sheets of steel which have a certain thickness that dictates their use. However, forged blades undergo a more complicated and even more effective process than blanking. 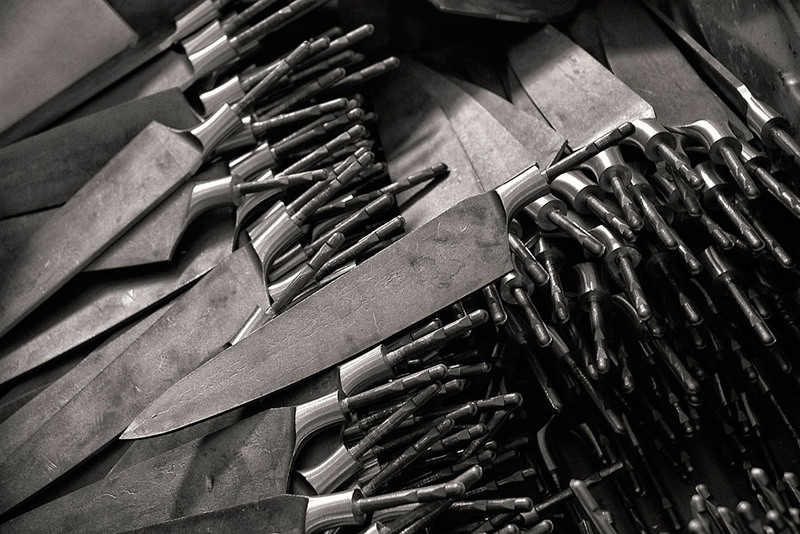 We use these blades for table and kitchen knives, and sometimes even for special collectable knives where the forging requires skilled craftsmanship using a hammer and anvil. During this process the steel is compacted, which gives it its excellent hardness and resistance. Furthermore, forging already helps to create the shape of the blade, including the bolster and the tang which will then be inserted into the handle. Once they have been hallmarked, sharpened and ground, both types of blades undergo tempering and annealing heat treatments which, depending on the composition of the steel, determine its correct degree of hardness for the optimum cutting edge. The tempering processes have also evolved based on the properties of new steels and today cryogenic treatments are used which, thanks to the very low temperature of the liquid nitrogen (- 196° C), are able to bestow a better microstructural stability to the steel and consequently better hardness and resistance to wear and corrosion. These special processes allow us to create exclusive shapes that can be designed or personalised upon request, providing a unique, recognisable style just for you. The use of this material is linked to its historical importance. The 16th century knifemakers’ statutes tell us that even back then knives were being produced with a handle made from cow horn. The rural nature of the region ensured that this material was readily available here, while its workable properties made it suitable for many different purposes. As it primarily consists of keratin, when you heat the horn it becomes malleable since it takes on a plasticity that allows it to be flattened or bent, which then hardens once it has cooled. This material was in high demand not just for making knife handles, but also for combs, hair clips, shoes and many other everyday objects before the arrival of plastics. In addition to its ductility, this material was, and still is, appreciated for its natural colouring, which becomes highly refined once it has been polished with a brush. This material is very similar to cow horn, except for its structure and colour. In fact, while cow horn has a circular cone shape, buffalo horn is flatter with an undulating, uneven surface. It is typically black in colour with shades of grey and brown. However, there are various species of “blonde” buffalo that have a more amber colour, as well as “striped” species, which instead have white graining that creates beautiful striations over the black horn. Crafting the handle of a knife is one of the most fascinating aspects of our profession. With our experience and craftsmanship, we are able to work this natural material from its initial raw state, thereby creating a range of materials based on the quality and specific features that only Mother Nature can provide. Olive wood is in high demand on the market due to its unique grain. The olive tree also has a very special scent and even though it was not very widely used in the past for the production of knives, it is currently very popular on the foreign market. This popularity is also down to the fact that this wood is commonly linked to the region of Tuscany. The box tree was a widely used plant in Italian gardens. It is the classic hedge with small leaves and a rounded shape. It grows very slowly and its trunk increases by just over 5 mm in diameter per year. It is very rare to find bushes above 40/50 mm in diameter. Due to its very slow growth, its wood is also remarkably compact and hard. In the records of old knifemakers, box wood was described as being as hard as iron, so much so that it was used for the handles of work tools. Box wood has a straw yellow colour and a very compact grain with small knots. This wood is very widely used for furniture and in certain professional jobs, such as barrel making. It has a light colour and an even grain; it is very hard and resistant. Padauk wood comes from tropical areas in Africa and Asia. It has a bright red colour and a long, even grain. It is a very hard wood and tends to become darker if exposed to sunlight. This is a very hard wood from tropical areas of Africa. It is dark brown to black in colour, with a variety of very subtle to clearer graining. It is a very special wood and while it is being crafted it releases extracts that are very similar to the cocoa tree. Mahogany is a typical American wood with several different varieties. It is very similar to the sapele tree, which instead grows in Africa. It is reddish to russet in colour which becomes lighter towards the surface, while the grain is thick and fibrous. This is a very resistant and compact material which is crafted by pressing the bamboo fibres. Its properties are particularly suitable for heavy usage and it is extremely water resistant. Scarperia knives have always been outstanding handcrafted products, so much so that the Knifemakers’ Statutes were written down as far back as the 1500s, stipulating the rules on the sale and use of materials, as well as safeguarding the quality of any cutting tools from Scarperia. Our products have survived wars, knife prohibition laws, shortages, earthquakes and even lifestyle changes and modern times; we’re sure to keep moving with the times. We remember our past and here at Saladini we still know how to use this knowledge, crafting our handmade knives with the same perfect proportions and attention to detail as our forefathers. Knives used to be the jack-of-all-trade items that you had to keep in your pocket all the time, but now more attention is paid to every single detail and also to the crafting techniques so we can keep up with the times. This does not mean we have sacrificed our artisan craftsmanship; we still assemble and add the finishing touches to every piece by hand and we even still forge some parts on an anvil. 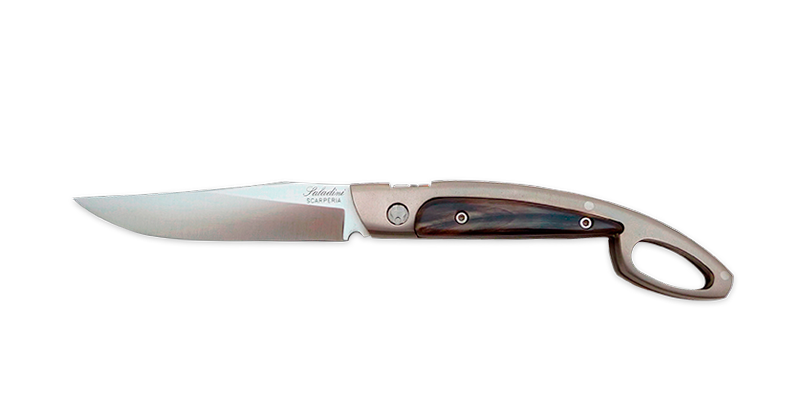 Saladini knives employ a new concept in the use of their materials, which are the same as our ancestors once used. However, thanks to new technological possibilities, we have perfected these materials while always staying true to our classic designs. The blade operates on a Teflon bushing, which helps the opening and closing mechanism to run smoothly. While we have abandoned the riveted nails that we used to hammer in to lock the blade and now prefer to use stylish male and female stainless steel screws featuring our company logo, the Scarperia castle tower. This option also allows us to work on the knife should it need any servicing without having to grind down the dowel pins, which would ruin the knife. Our philosophy is to cherish and develop our craftsmanship traditions so that Scarperia knives will be appreciated and used for a long time to come. 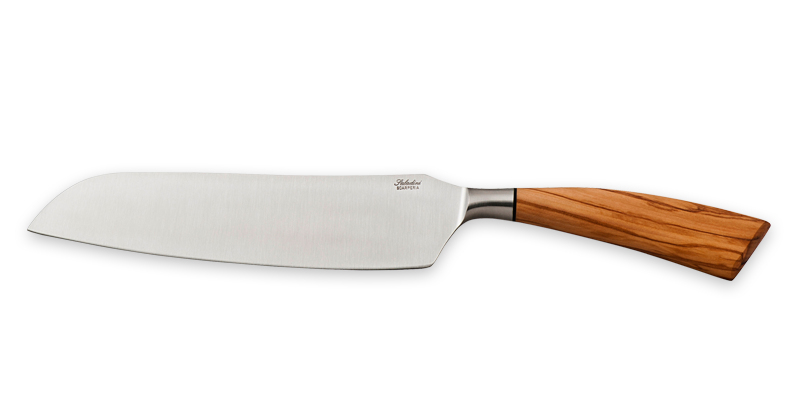 Saladini kitchen knives have been designed to meet your cutting requirements, whether at home or in a professional environment. The forging process compacts the steel of the blade, which is then sharpened and tempered before it is inserted into the handle with a hidden tang. The finishing touches are added afterwards by hand, including its final sharpening. With our experience and craftsmanship, we are able to work with natural materials from their initial raw state, such as the traditional ox horn or olive wood, thereby creating a range based on the quality and specific features of the materials. In 1997, Leonardo Saladini came up with the idea of crafting the handle by using the natural curve of the ox horn to his advantage, creating a model of handle from a single block of material (the solid handle), which then became a source of inspiration for the whole cutlery sector. In addition to its very neat aesthetic lines, the solid handle has other advantages over the normal scale covering that is fixed by rivets. In fact, these rivets constitute a weak point where water and dirt may enter into the handle and, over time, may compromise its integrity. Therefore, the solid handle provides greater resistance to external agents and maintains its integrity provided it is properly looked after. Our town’s history has provided us with a wealth of many ancient models of knives, which have been handed down to us despite different knife prohibition laws and their inevitable deterioration over time. These ancient knives still preserve their charm. We call them “special”, but they should be seen as real collectable gems, some of which are adorned with metals, inlays and etchings. 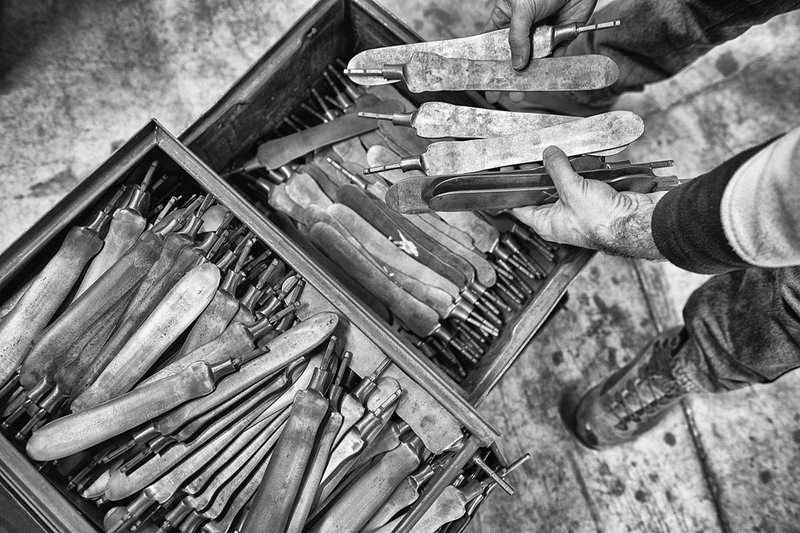 Our copies of these legendary knives have been carefully crafted by hand. They are only made to order due to the difficulty and many hours of work involved in the meticulous finishing. These collectable knives represent the real historical and artistic heritage that we are seeking to hand down, with all our passion for this profession. 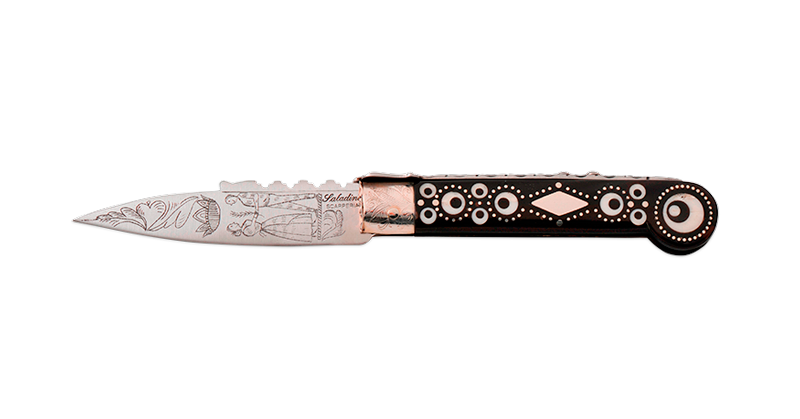 This Saladini line is dedicated to the world of cigar smoking, featuring pocket and table cigar cutters. 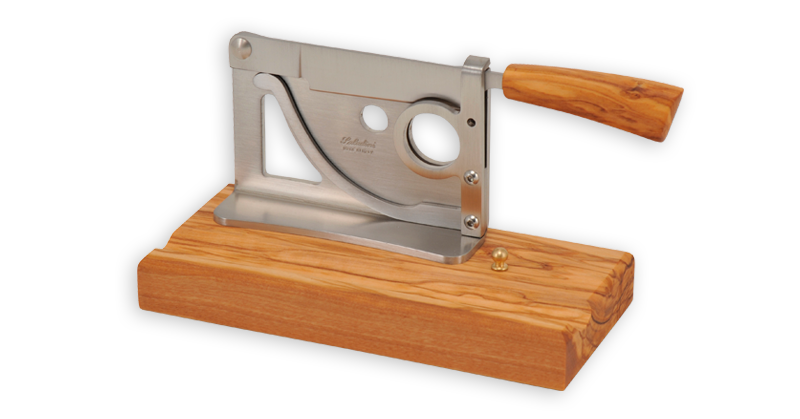 The sophisticated finishing and blade are the stellar features of a Saladini cigar cutter. They work just as well for miniature cigars as they do for larger gauges. The panelling is always made from traditional natural materials, such as ox horn or olive wood, although they may be personalised to suit the customer’s preference.